MaMa says it's the most wonderful time of the year! I'm loving all things Christmas, except for that guy they call Santa...he scares me. Directions: Position rack in middle of oven. Preheat oven to 350 degrees F.
Coat an 8-inch square pan with nonstick spray. Whisk together flour, baking soda and salt in a medium bowl to aerate and combine; set aside. Beat butter with flat paddle on medium-high speed until creamy, about 1 minute. Add sugar and beat until light and fluffy, about 3 minutes, scraping down the bowl once or twice. Beat in egg until well combined. Add the flour mixture in two additions, alternately with the buttermilk. Begin and end with the flour mixture and beat briefly until smooth. Scrape batter evenly into pan and smooth top with offset spatula. It will be a fairly shallow layer. Scatter blackberries evenly on top, reserving about 5 of them; do not press into batter. They will sink during baking. Bake for about 15 to 25 minutes or until a toothpick shows a few moist crumbs. The cake will just have begun to come away from the sides of the pan. Cool pan completely on rack. For the icing, combine brown sugar, butter and cream in small saucepan and bring to a simmer over medium-high heat. Simmer for 1 minute, whisking frequently. 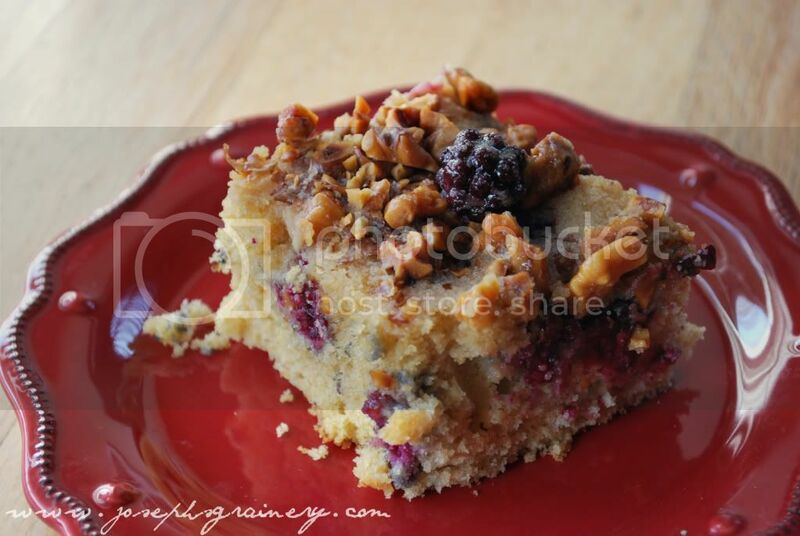 Drizzle half of the icing with a spoon all over top of cake, then quickly sprinkle walnuts and reserved berries evenly over top while icing is still wet. Drizzle with remaining icing, which will set up almost immediately. The smell of these walnuts toasting in the oven and then sprinkled on the cake definitely made us think Christmas, but it was the Driscoll's Blackberries that stole the show! Plump, moist and flavorful, they complete the cake. 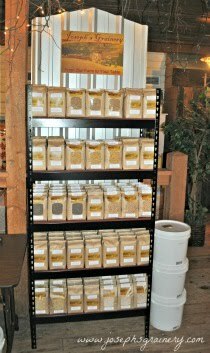 That's why we thought it would be fun to wish you a Berry Merry Christmas by hosting a giveaway of coupons for Driscoll's Berries. 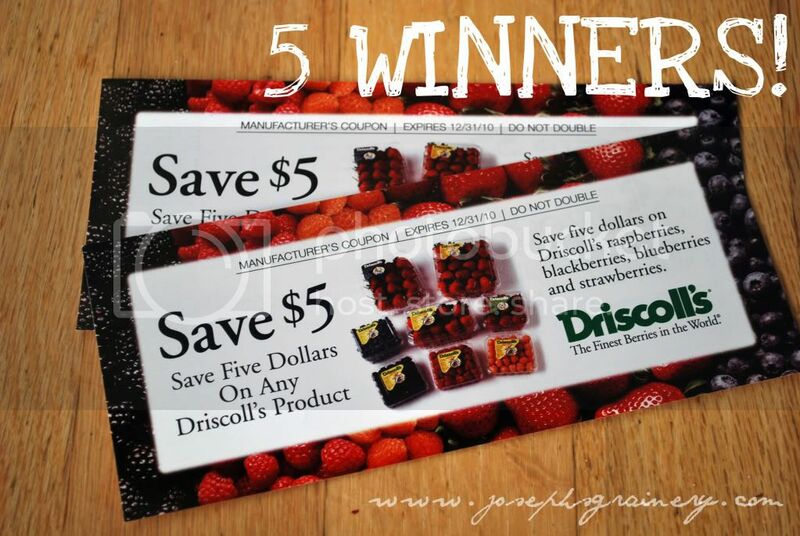 Five lucky readers will each win $10 in Driscoll's Berries Coupons! To Enter, leave a comment below telling us what your favorite holiday dish is that has berries in it. You must be a follower/subscriber to enter, open to US residents only and the giveaway ends Monday, December 13th at midnight (PST).